The New York State Senate is the upper house of the New York State Legislature. Its sixty-three members represent New York State and its more than 19 million citizens. The legislature’s primary purpose is to draft and approve changes to the laws of New York. These changes are driven by complex public policy issues. To effectively represent the will of the people, senators must gain a deep understanding of those issues and how they impact New Yorkers. This website aids in that effort. NYSenate.gov is designed to increase public participation in the legislative process. By facilitating efficient communication between individual New Yorkers and the senators who represent them, lawmakers are able to craft a better set of laws by which we are governed. The Legislature is the law-making branch of state government. It is a bicameral, or two-house, body composed of the Senate and the Assembly. The Constitution authorizes a Senate of varying number, currently 63 members, and an Assembly of 150 members, who are elected from districts throughout the State for two-year terms. Each member of the Legislature must be a United States citizen, a resident of the State for five years and, in most cases, of the Senate or Assembly district for one year preceding the election. After each election, the Senate elects from among its members a Temporary President who serves a two-year term. Traditionally, the Temporary President is the ranking Senator of the majority political party — the Majority Leader. It is the duty of the Temporary President to direct and guide the business of the Senate, appoint Senate committees, name Senate employees and perform or delegate to another Senator the duties of the President during the Lieutenant Governor’s absence from the Senate Chamber. The Constitution reserves varied and extensive powers for the Legislature. The most important is that which permits the Senate and Assembly to propose laws, within the limits of the Federal Constitution and certain Federal statutes and treaties. These laws first take the form of bills, which may be introduced in either house. A bill passed by one house must be passed in the same form by the other before it can be sent to the Governor for a signature or veto. The Senate and Assembly have several additional powers that are reserved solely for them in the Constitution. An important weapon in legislative deliberation is the override of the Governor’s veto. The Legislature can approve a law despite a veto by the Governor with the support of two-thirds of the membership in each house. However, the most common lawmaking procedure is the result of compromise among the Senate, the Assembly and the Governor. The Senate alone has the power to confirm the Governor’s appointment of non-elected state officials and court judges. The Constitution provides that such appointments are subject to the advice and consent of the Senate, which approves or disapproves them, after hearings on the candidate’s qualifications. The Legislature, through its varied functions, serves as a check upon the executive authority of the Governor and helps ensure that the best interests of the State’s citizens are legislatively represented. The job of the Senate is to work with the Assembly and the Governor to enact, amend or repeal statutes which make up the body of laws by which we are governed. This involves drafting, discussing and approving bills and resolutions. The text shows the process in a simplified progression from "Idea" to "Law." At any step in the process, participation by a citizen or group of citizens is as easy as making a call, writing a letter, or signing a petition being sent to your Senator, any other legislator or the Governor. The Constitution is the foundation of New York State Government. Moreover, it is the document that gives the Senate - together with the Assembly and the Executive - the power and responsibility to create and maintain the Laws of New York. The Rules of the Senate list the procedures that Senators must follow for bills to make it through the lawmaking process. They are crafted to ensure that the Senate stays focused and productive. Under the Rules of the Senate, all Senators vote to elect one its members as Temporary President (or ‘President pro tempore’) of the New York State Senate and Majority Leader. The position of Temporary President was created as a standing office by a constitutional amendment in 1873. The President pro tempore was elected for the duration of the biennial senatorial term which comprised two sessions, the first in an even-numbered year, the other in the following odd-numbered year. It is the duty of the Temporary President to direct and guide the business of the Senate, appoint Senate committees, name Senate employees and perform or delegate to another Senator the duties of the President during the Lieutenant Governor’s absence from the Senate Chamber. Each Conference in the Senate also elects its own Conference Leader and other conference leadership positions. The Temporary President and Conference leaders are all currently limited to a term of eight years under the Rules of the Senate. To the right, Justice is ready to fight tyranny with her sword held high. The Senate Gallery is open to the public any time the Senate is in session or during guided Capitol tours. Guided tours of the Capitol are available daily and free of charge. For Capitol tours, groups of 10 or more should make reservations, by phone, two weeks in advance by contacting your Senator, or the New York State Office of General Services Plaza Information Office at (518) 474-2418. It is also recommended that all visitors call ahead to confirm the daily schedule. The Capitol building is located on the intersection of State Street and Washington Avenue in Albany, New York. From the halls of higher-learning to the halls of the State Capitol, New York State Senate Student Programs offers undergraduate and graduate students exciting opportunities to learn about state government and to experience firsthand the legislative process. If you have ever thought about a career in public service or state government, now is the time to get started! Our on-site, experiential learning programs provide students with a work experience that is both professionally rewarding and academically enriching. The Senate is committed to maximizing the transparency and accessibility of legislative information for all New Yorkers. Through a series of novel initiatives, the Senate continues to lead nationally in providing new ways for citizens to participate in the legislative process. 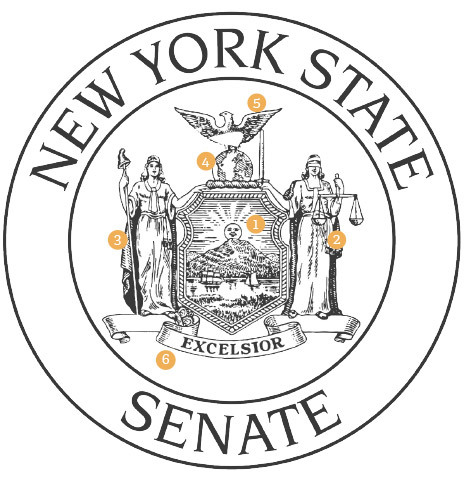 Open Legislation is a web service that delivers legislative information from the New York State Senate and Assembly to the public. It provides the legislative data at the core of nysenate.gov, and that data is freely available via an API. See the Senate in action first-hand. Keep track of the many events at the Senate. You can watch Senate session, public hearings, committee meetings, and other events and activities. You can also find events that you might want to attend in person. Use to the event calendar to find the events that are important to you. You can find events such as session, public hearings, committee events, and senator events. Search by event type, committee, or senator. Find out when the Senate is in session. The Senate live streams all official proceedings. Click through to the event to watch live, or view an archived copy of the video. Find out what bills will be discussed in the Senate Chamber. This electronic form is provided for the convenience of local governments wishing to submit a Home Rule request. Unable to find the Senate information you are looking for? It may be available by making a Freedom of Information Law (FOIL) request. Please visit our online FOIL Request page to learn more. We encourage citizens and companies to leverage and add value to Senate data by building custom applications. All data and other content used in NYSenate.gov and Open Legislation is licensed under Creative Commons copyright. Legislative data is available through the Open Legislation application programming interface (API). Search the administrative facts and figures of the Senate. Find expenditure reports, payroll reports, and other reports as well. The Senate uses open-source software whenever possible. In our experience, open-source software is reliable, secure, and cost-effective. It also provides us with the flexibility necessary to create software that meets the Senate’s needs. We also support the greater open-source ecosystem. We have sponsored new functionality in open-source projects, and have contributed our own code to projects. We also open-source our own code whenever possible so that others can benefit from our work. Find code for our projects (including nysenate.gov) on GitHub.